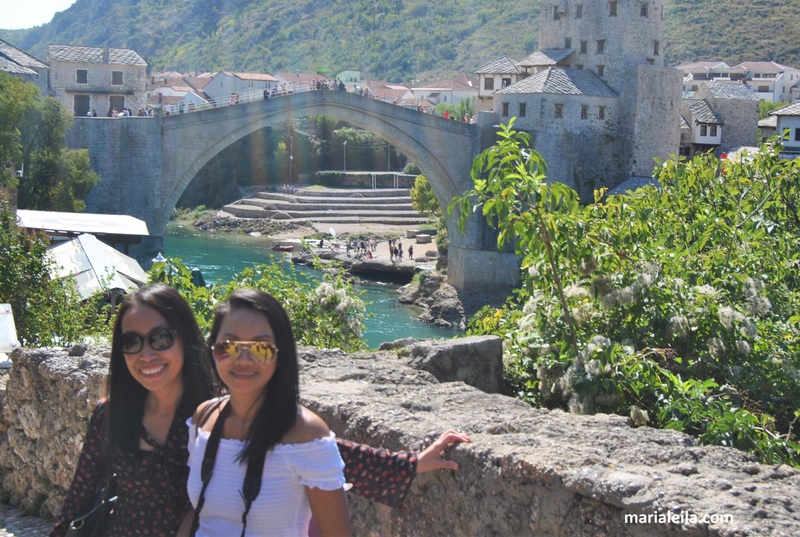 Truth be told, I’ve never heard of it until I searched for places near Dubrovnik that my friend Lillian and I could go for a day trip during our stay in Croatia last year. A photo of its iconic bridge popped up on my screen and right away I fell in love with it. When I thought of Bosnia and Herzegovina (BiH), it was about the war that was constantly on international TV channels for over three years. I remember flicking through CNN, BBC and other news networks way back and it was there , a constant reminder of how people can be easily triggered to go all the way to the dark side. (Do they give choco-chip cookies over there?). So BiH was never on my travel radar. 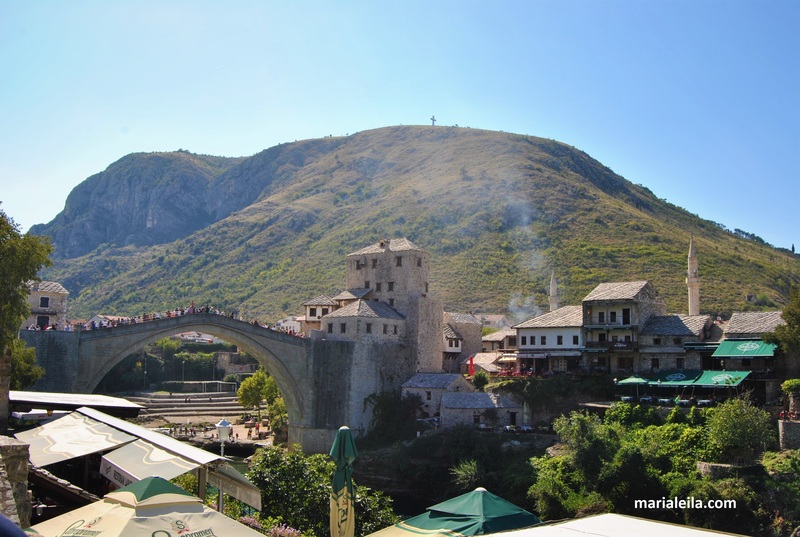 I’m glad the universe aligned its stars and made me visit Mostar to change the outdated version of it on my mind. One thing I right away noticed – there was a church, a mosque and a synagogue just a few minutes from one another. I voiced this out to our guide as we walked towards the old town and he said they all learned to live like that, to accept each other’s religion. He said it’s normal to be in an interfaith marriage in BiH, that they mark and celebrate all holidays. The good is that they can drink and be merry during the celebrations. The bad, economy wise, is that there’s hardly time to work and be productive. I said I wonder how many of the population share the same sentiment. After all, religion, for centuries, has been one of the constant reasons of unrest. He said no, religion or faith has nothing to do with it. It has always been power and greed. Religion is just used as a tool to be manipulated by the powerful and greedy. Preach, brotha! Entering Mostar’s old town reminded me a bit of those little alleys around Alhambra in Spain. There’s this certain vibe I cannot put my finger on. It’s a great vibe, nonetheless. 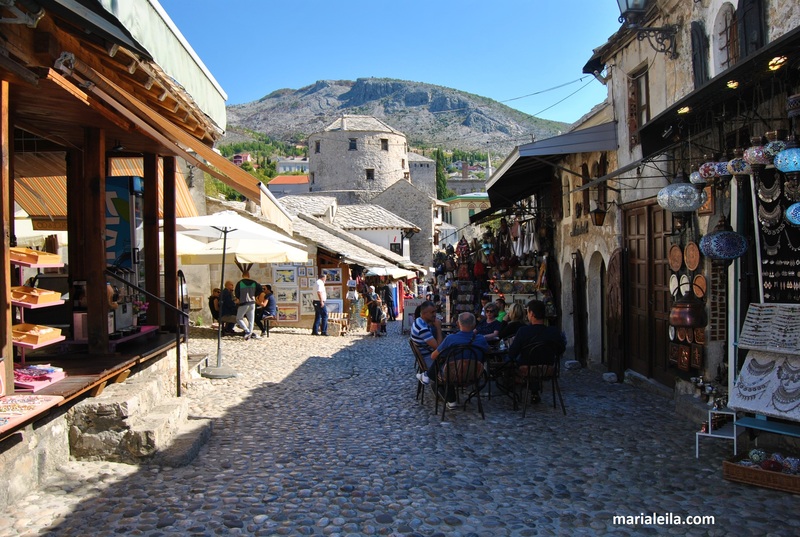 Like most old towns in Europe, Mostar’s is a haven for tourists looking for souvenirs and local products to take home to. 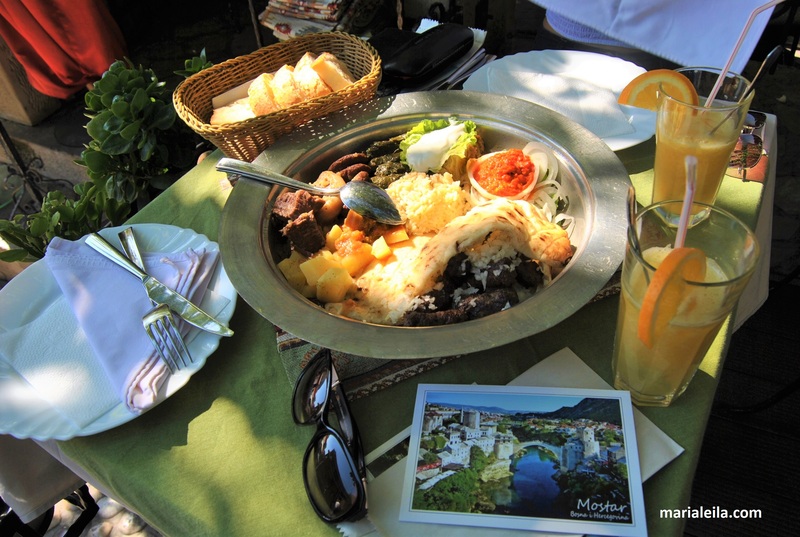 It also has a lot of restaurants that offer a taste of authentic Bosnian cuisine. The bridge held up to my expectations. It is very pretty especially if you look at it from a distance with the river down below and the restaurants and establishments around it. Up close, you realize it’s not an easy walk on or across the bridge as the arch is quite steep and the stones are slippery. 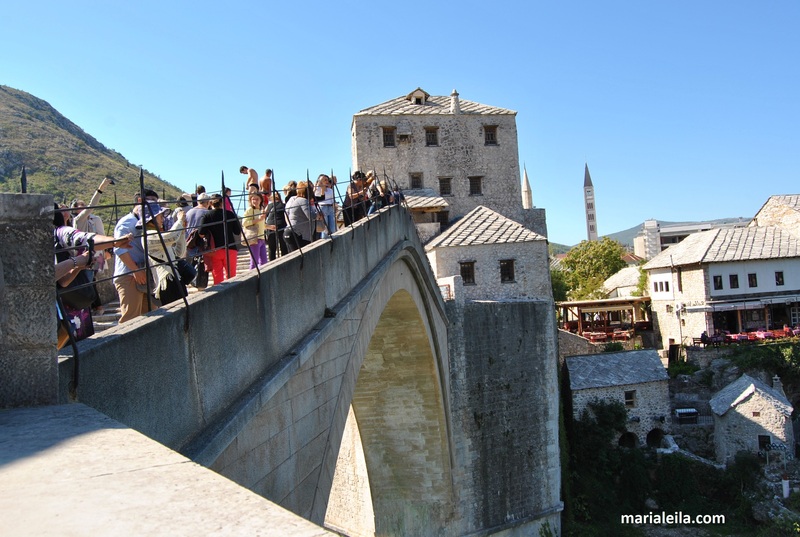 Whatever you do, do NOT wear flip flips or any shoes that are bordering to uncomfortable when you visit Mostar. Those people who did when I was there, it was extremely painful to look at them crawling their way up or down the bridge. One of the most interesting happenings here is bridge jumping. Yes, people actually jump off the bridge. I don’t know if they do it for fun, recreation, adrenaline or money. My guess is a little of everything. It looked dangerous but everyone who jumped when we were there looked alright after. By Restaurant Sadrvan there’s a path that brings you down to the river. This is a great spot to watch those daredevils jump. Eating is a major part in my travels. That’s where the biggest chunk of my budget goes to. For lunch, Lillian and I went to Sadrvan. It was full and crowded and I thought, oh no, we might have to catch up with our tour group in an hour without having anything to eat. Luckily we got ushered to a table only after a few minutes of waiting. We ordered their national dish for two and boy when it arrived on our table, my happiness meter instantly soared up. On the huge plate were different samples of their local dishes, all arranged to activate instant drooling. Each dish complimented one another to create a well satisfying meal. 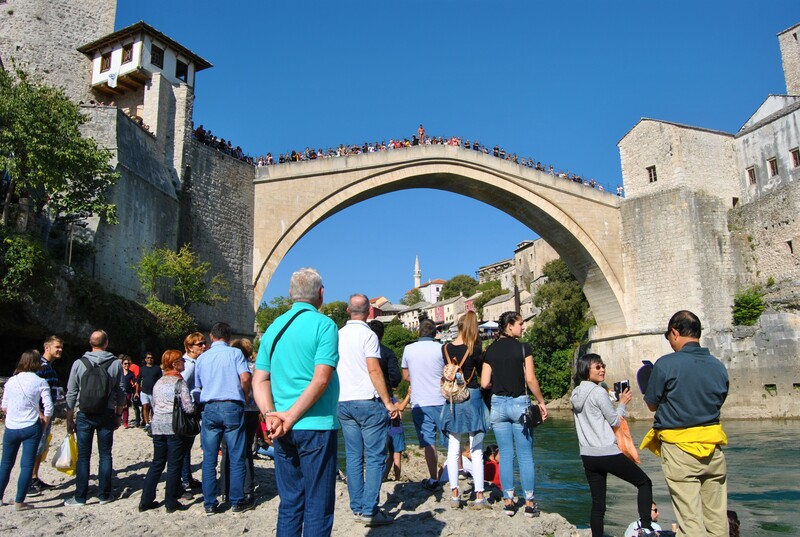 It was as if my first impression of Mostar, with their different beliefs apparent in the churches, synagogues and mosques within easy reach from one another, got transferred and served on this silver platter. Off the shiny, shimmery, splendid Old Town is the city’s main Boulevard. I saw some apartment buildings still stained with bullet holes as our tour bus drove past them on our way back to Croatia. 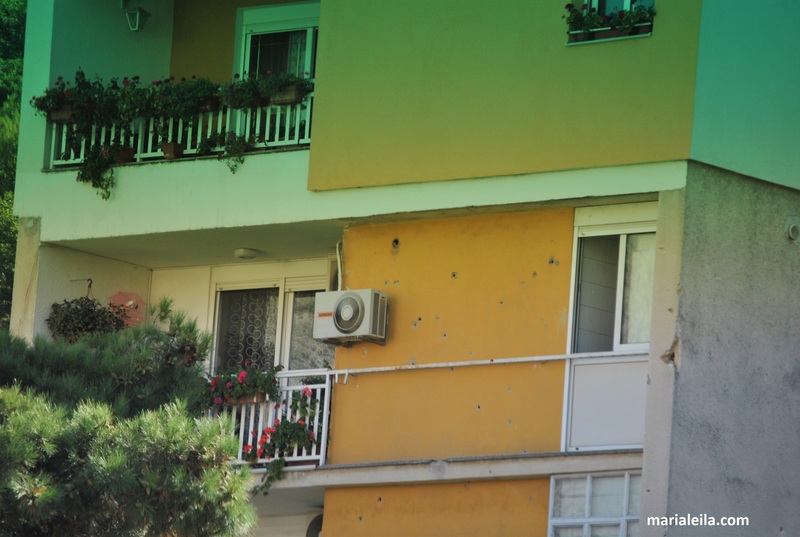 Those bullet holes are a sad reminder that once upon a not so long ago time, Mostar was a melting pot of hatred. 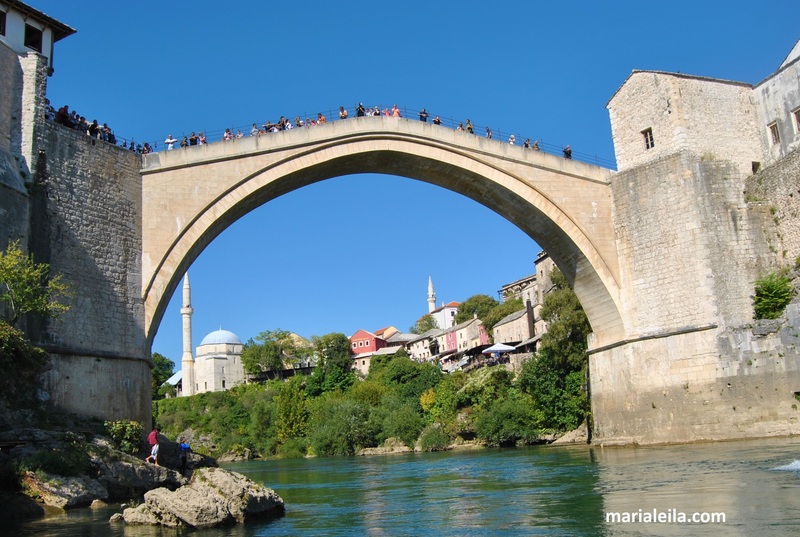 This entry was posted in Bosnia and Herzegovina, Travel. Bookmark the permalink. Wow, its almost a year since we visited this place. I miss our escapades there. 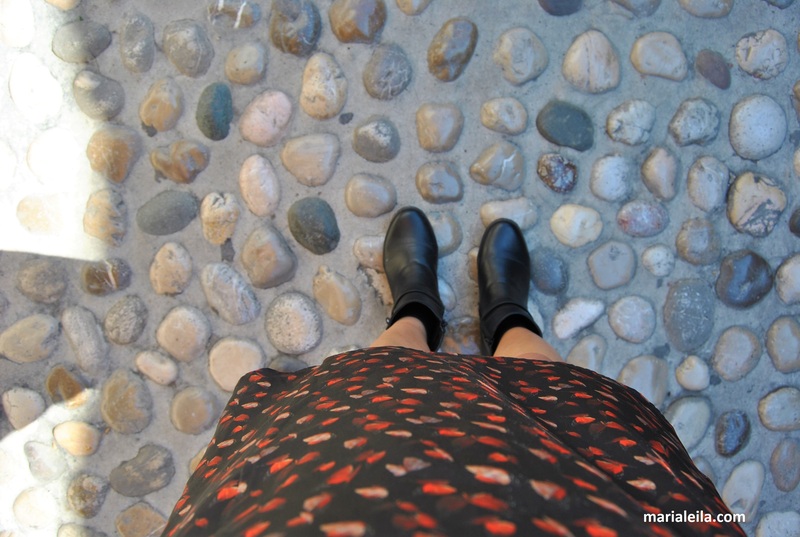 Your blog is always on point. “The good is that they can drink and be merry during the celebrations. The bad, economy wise, is that there’s hardly time to work and be productive.” -> 🤣 I could say it’s the same here in Indonesia. Luv your pictures as usual 😍 And it’s great to see you’re blogging again!